Damien Social Welfare Centre is named after St. Damien, the Leper Priest, as he is better known, a hero of Molokai, Hawaii. He served the lepers at Molokai from March 1864 till his death on 13 April 1889. He volunteered to serve the abandoned leprosy patients in Molokai, when no one, even under the vows of obedience, agreed to go. At the age of 49 Fr. Damien had become a victim of the dreaded disease in the course of serving the outcaste lepers. Fr. Mike Kavanagh, S.J. an American Christian Missionary from Maryland Province, the US, started Damien Social Welfare Centre (DSWC) in 1964 as part of a Social Action Plan of St. Anthony’s Church, Dhanbad. DSWC was formed as an inter -denominational and inter-religious society that cares for people suffering from leprosy. 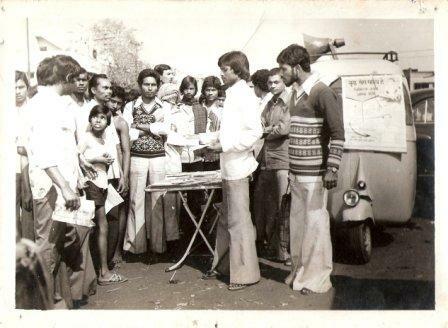 The Society distributed food, provided housing and dispensed whatever medicines were available with it. Fr. Kavanagh involved the members of his Christian community, doctors, nurses and the leading citizens of the town, to contribute financial support as well as their time and service. Within a short period of time, there was a growing realization that the needs of the leprosypatients required a much more professional approach than taken then. Hence they undertook a comprehensive and multifaceted survey to find out more about their situation and thus to plan for their treatment, education and rehabilitation. As a follow up to the findings, in 1965, Dr. A.K. Mukherjee was made Director of Medical Services in order to initiate a chain of mobile clinics in Dhanbad District. As a result, within a short time, 2,100 cases of leprosy were registered for treatment. The German Leprosy & Tuberculosis Relief Association (GLRA) was impressed by the joint effort of all communities and gave whole hearted support. In 1967 the Samaritan Sisters of Kerala, India, accepted the invitation of Late Cardinal Lawrence Pichachi, then Bishop of Jamshedpur Diocese, to join DSWC as part of its medical action, which then took care of 25 mobile clinics with the help of a jeep, donated by Caritas International. Additionally, Sr. Dr. Luca, S.H. Sp. joined the team and gave new impetus to the medical program which covered over 130 villages. In 1969 DSWC became a registered society under the Societies Registration Act of 1860 in Bihar as a ‘…voluntary, charitable and non–profit making organization dedicated to the detection, treatment and eradication of leprosy in the district of Dhanbad. In 1972, Fr. 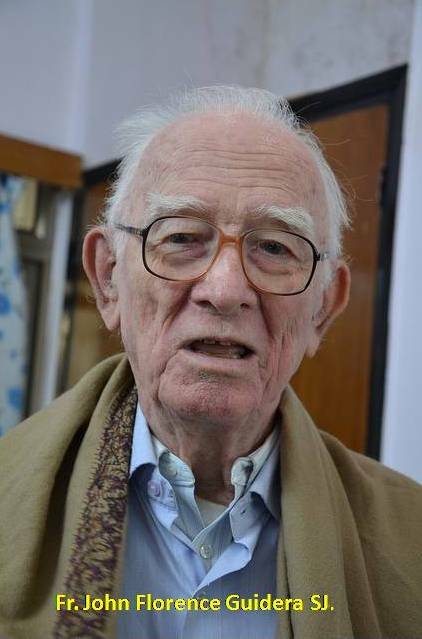 Lawrence J Hunt, S.J., a successful educationist in USA and Jamshedpur, succeeded Fr. Kavanaugh, S.J. as Director of Damien Social Welfare Centre. During his stewardship, DSWC developed into the massive social service project, spread over the entire northern part of the Dhanbad district, from Gomoh to Kumardhubi, and embracing such diverse activities as leprosy hospital, leprosy clinics, schools and hostels for the children of leprosy patients, training centres for boys and girls, and adequately equipped rehabilitation centre with the necessary machines as well as a large programme of Public Education with the logo: "Leprosy is Curable". He was always available for the people. He made the leprosy patients realize that they were human beings and not an outcast. By the time Fr. Larry Hunt left for USA in 1983, the Centre had a 150 bedded well equipped central hospital, two field hospitals, 156 clinics, a leprosy control project for a population of 7,00,000 and a rehabilitation department. It had a hostel each for girls and boys with facilities for carpentry, smithy, motor driving, motor mechanics, welding, turning, tailoring, agriculture and home science. It also ran two paramedical workers' training centres. Mr. Sircar, once a leprosy patient from Puri, Orissa was the manager of the Main Hospital. The Damien Hospital was treating nearly 24,000 leprosy patients, all over Dhanbad district. He had roped in the students of De Nobili School, Dhanbad, to collaborate in the eradication of leprosy, and to remove ignorance and fear concerning the disease. As it is always difficult to replace a legendry leader, so it was not easy to replace Fr. Hunt. Thus 1983 to 1986 DSWC had hard time. After Fr. Larry Hunt’s departure things were not smooth for Fr. Walter Kongari SJ, who succeeded Fr. Larry Hunt. He was appointed only for the time being. He served the organization only for a year. Then, Fr. 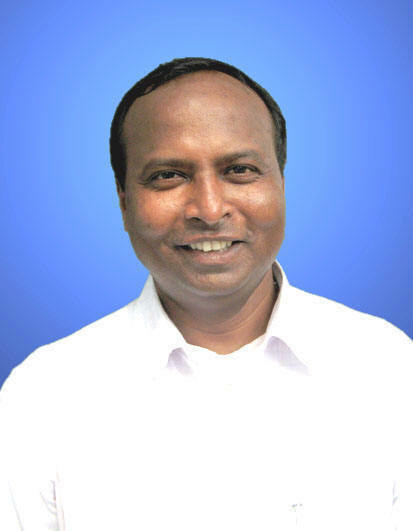 JC Prabhu SJ was brought in to reshape DSWC, but due to his ill health, he could not take DSWC any further. Fr. Vijay Bhat came as the Acting Director in place of Fr. JC Prabhu, but later on through his perseverance and hard work not only sustained DSWC and all it’s units but also initiated a small fund for its future work. From 1986 to 1995 was the Golden Era of DSWC. During these years Fr. Bijay by his shear charismatic leadership and planning started the Nirmala Female and Child Ward, the Home for the Aged (VIP) at Govindpur, the Multipurpose Halls in Nirmala Hospital and in Nirmala, Govindpur and Gomoh Hostel and schools were built. Besides the female ward at BMP and the high school building at Gomoh are the proofs of his leadership and vision. Fr. Bhat opened the school doors for the local children so that the children from the leprosy families overcome the fear of inferiority complex and compete in their school/class along with the other students. He also sent capable, motivated students for higher education and technical training. Many of such students are holding good government or private jobs. He did not limit himself to the people themselves but he found time for trees and for animals. The tall trees and greenery in the Nirmala Ashram are his gift to DSWC and he loved them all. Fr. Vijay served the organization till 1995. Fr. 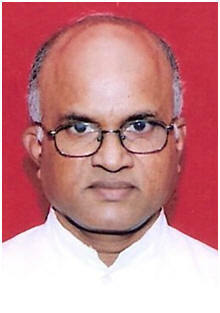 Gerald Martin D’ Souza succeeded Fr. Bijay. It was quite difficult to cope up the demands of the time. 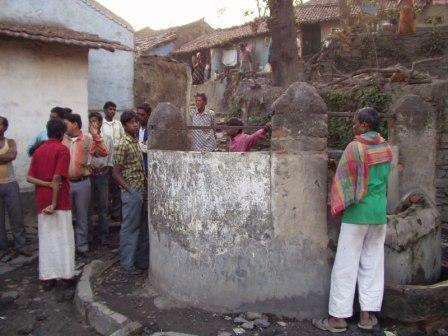 It was the time when government started showing some interest in the leprosy work. Fr. Gerry Martin joined hands with the government in the campaign of eradicating leprosy. But unfortunately government system was slow in providing medicine and releasing funds. In the bargain DSWC lost the touch of foreign benefactors and well wishers. There was financial constraint at DSWC. It was the time when Fr. John Florence Guidera SJ, a big structured man joined DSWC to offer his service. He had a charismatic personality. It is he, who started ‘One Dollar Club’ among his friends in the US. He had big heart for the poor people. He always talked about the youth. He only started Mac Fund to provide job oriented training to the youth, so that these youth, having under gone training, could gain self confidence and become the bread winner of the family. Fr. Guidera managed to rehabilitate many families because of his keen interest in them. Fr. Gerry Martin completed his term in 2001. And there came Fr. Alex Misquith SJ for time being. He stayed at DSWC only for two years. Fr. Walter Crasta succeeded Fr. Alex Misquith in 2003. It was Fr. Walter Crasta, who took the challenge to teach them the value of self dignity. Till his arrival everything in the Hospital and in the School was free. This was also the time when WHO declared that leprosy is eliminated from India. The foreign support started drying up. The big blow came when GLRA withdrew its support. However, before withdrawing GLRA helped DSWC to construct Nirmala School, Govindpur. Nevertheless, it was a difficult time for DSWC. Due to financial constraint DSWC had to close down its field hospital at Baramsia Mercy Post. 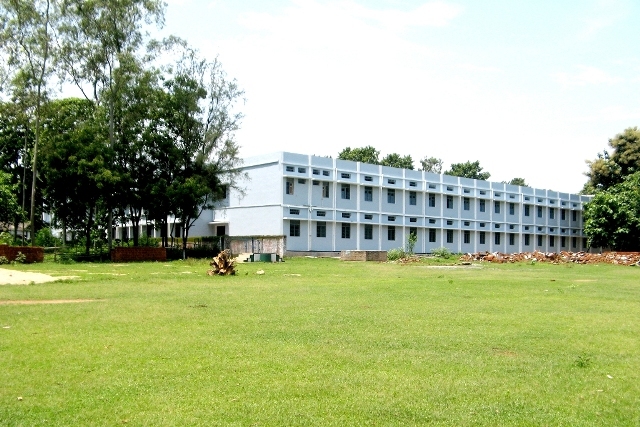 De Britto School and technical center had to be given to Jamshedpur Jesuits. Nonetheless, DSWC can not forget that it was Fr. Walter, who taught these people from the leprosy background that “there is nothing in the world that is free”. He started with minimum charges in the hospital and in the school. In the beginning people were reluctant to give, but eventually they are giving whatever they can. During his time in 2009 English Medium School was started seeing the need of the present time. Now there Hindi Medium and the English Medium School are simultaneously going on at Nirmala School, Govindpur. Fr Walter Crasta served the organization till 2011. Fr. Bipin Pani succeeded him. 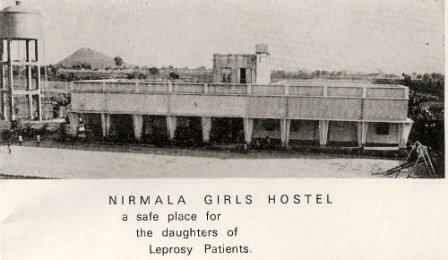 Nirmala Leprosy Hospital, Govindpur is situated 14 KM from Dhanbad railway Station. 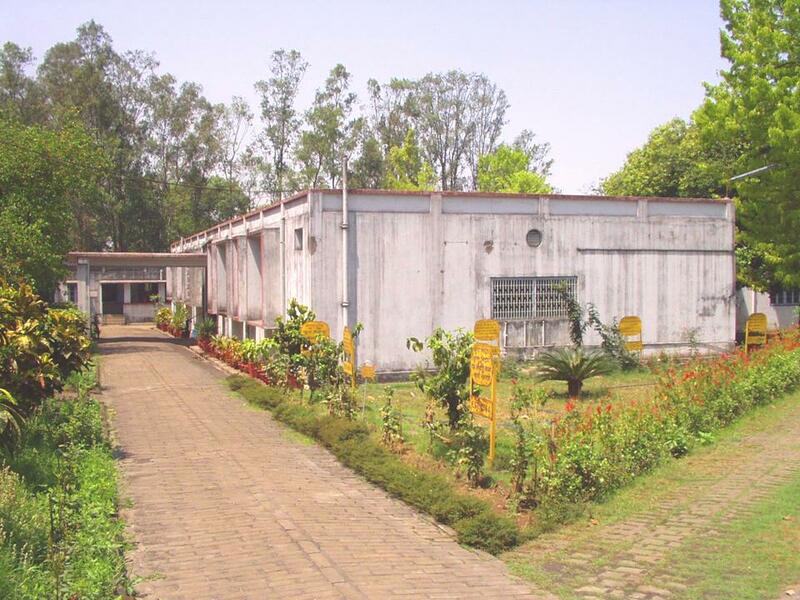 It was opened in 1969 and has gradually grown into a 150 bedded Hospital equipped will all the requirements to treat cases of leprosy and tuberculosis. Today, N irmala Leprosy Hospital is better known to the public than DSWC itself. The hospital had been providing free treatment to all, irrespective of social status, caste or religion till 2008. But as the funding supporting started drying up, it started charging minimum consultation and hospital fees to the patients At present Nirmala Hospital is charging Rs 30/- to the in-patients for per day. In addition to regular treatment of ulcers, a great emphasis is placed on physiotherapy to help the patients improve their strength, blood circulation and agility. Reconstructive surgery is also available to the patients, though of late the number of patients for the surgery has reduced. In 2012 Eye Unit is started, with the help of St. Francis leprosy Guild, UK, for the benefit of all. There is also facility for the eye operation. At present this Hospital is also opened for the benefit of general patients. In 1966 Rev. E. Sadiq, pastor of the Anglican Church gave permission to use his building at Baramasia as a clinic in order to serve the patients from nearby villages. Soon it attracted many leprosy patients to Baramasia Mercy Post (B.M.P) It could give nursing service to 60 leprosy patients at a time. It houses patients with severe wounds and ulcers. The clinical facilities also provided outpatient services. Doctors from Nirmala regularly visited BMP. Whenever more specialized care was required; the patients were shifted to Nirmala Leprosy Hospital, Govindpur. But in 2009 the hospital service at BMP had to close down, as number of the patients declined due to lack of money from the part of the patients. It remained closed almost for two year. When Fr. Bipin came to the organization, he slowly started clinic service once a week and extended DSWC’s rehabilitation center by installing 8 handlooms to BMP. At present 8 persons are running handlooms and 6 persons are running charkha at BMP. Fr. Bipin also started vocational training viz. tailoring training for the school dropout girls. He gave new name to the center called Damien Vocational Training Center (DVTC), Baramasia. At present 15 girls are learning tailoring. 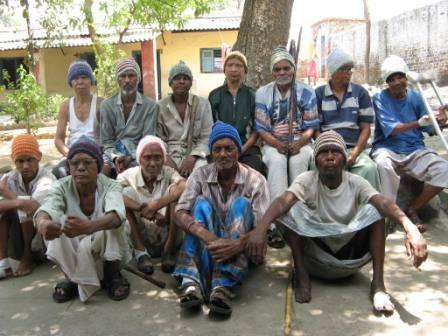 Rehabilitation marks the culmination of the leprosy control programme. The main objective of the rehabilitation programme for the cured patients is to improve their physical, mental and social, well-being. DSWC started BRTC in 1974. After a number of attempts in various activities, we have limited ourselves to handloom cloth production. We engage a work force of 81 for producing bandages, gauze, OT material, bed sheets, towels, saris, etc on 18 handlooms, twelve power looms, a manual drum,a power drum and calendaring machine. Since we want to employ as many as possible, we are forced to adopt very primitive labour- intensive methods. Though BRTC is running at lose, yet we know that it is giving bread and butter to 81 families. We are hoping that some benefactors would give us 25 KV generator so that we could solve the problem of electricity. Thus the rate of lose could be minimized. Settling down the cured patients in various colonies scattered in Dhanbad District has been a major concern of DSWC, as they were not accepted back into their homes. With the help of the Govt. (Indira Gandhi Awaas Yojana), local industrialists and other benefactors, 21 colonies had been built in Dhanbad district. Though isolating the leprosy-affected persons is against WHO directives and even against humanity, somebody has to provide shelter to these helpless people. As far as possible, DSWC continued to provide sanitation, drinking water, power supply, medical care and education of their children. The integration policy of the Government has affected our work and we are making efforts to organize the leprosy colonies into Self-Help Groups through training courses for leaders, women and youth. Located in Nirmala Hospital campus is a home for the Aged and Disabled called VIPI. It means though they are of no use for the family and for the society, yet they remain important for DSWC and so they are called Very Important Persons. These are the people, who have no family to care for them or have not been accepted back into their family once cured. At present there are 52 of them at VIP. Most of them, with DSWC’s initiatives and effort, are getting pension from the government. The Rehabilitation Society of Government of India has recognized DSWC as one of the centers for Reconstructive Surgeries and manufacturer of Micro Cellular Rubber [MCR] shoes. Our Shoe Dept. employs 3 full time cobblers for manufacturing / repairing shoes and sandals. Because of the presence of a rather big number of cured leprosy patients with deformities and ulcers (mostly from pre-MDT days) spread in 21 leprosy colonies and beyond, besides the new cases that come to our hospitals, a great strain is experienced by this department. DSWC has recognized the need for academic education in the upbringing of the children of the leprosy affected persons and thus to rehabilitate them. All the children of leprosy patients were offered free education with free books; uniforms, food and lodge up to secondary school level. DSWC also supported those students who are interested in pursuing their studies further. Through this educating process we envisage a better future for the leprosy affected people under the care of their own children. Following the integration policy that brought about financial constraints on our activities, we are insisting on token contribution. Nirmala School at Govindpur was started in 1968. the purpose was to give children of leprosy patients education and self confidence. Simultaneously DSWC also started Nirmala Girls’ Hostel to create educational atmosphere and protect these girl children from the early marriage. At present there are 176 girls in the Hostel and there are 287 children in the school. Nirmala Hindi Section is from Kinder Garten to Grade. VIII. In 2009 Nirmala English School was started so that the education activities of DSWC become self sustaining. At present Nirmala English Section is from LKG (Lower Kinder Garten) to Class IV. Finally, a word on field clinics: DSWC had a population of around 13 lakhs in its control area. We used to manage over 75 Drug Delivery Points (DDP) with 27 field staff namely 3 Non medical Supervisors [NMS] and 24 paramedical workers [PMW}. With the introduction of “Integration” the scenario has changed. "Integration" is a government policy which mandates that leprosy patients must seek medical services from government run facilities rather than much more capable private run facilities such as the Nirmala Hospital. Unfortunately the patients do not receive the care they require or even the medicine which could cure their illness at the Government outlets. Because of this policy, DSWC had to retrench all the field staff following the withdrawal of support from funding agencies for the field work. The problem of leprosy still persists. We still get new cases of leprosy almost everyday. Government does not accept the fact that there is leprosy in this part of India. In spite of government’s indifferent attitude DSWC is going ahead with its mandate of serving persons affected by any stigmatic or communicable disease to provide them quality medical services towards their total wellbeing and fullness of life. That is why this year DSWC also initiating the survey work. We hope after the survey we will be able to get the road map for DSWC. At present DSWC continues with the office clinic on Monday and BMP clinic on Tuesday.